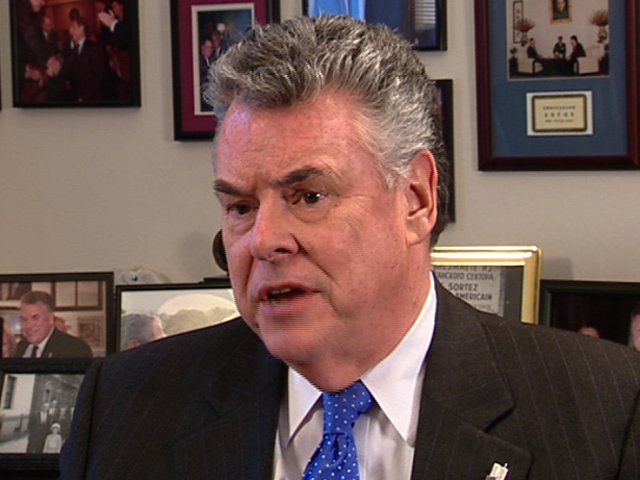 Rep. Peter King (R-NY), Chairman of the Homeland Security Committee, told CBS News Tuesday afternoon that if he could plan Thursday's hearing on Muslim radicalization over again, he would change nothing other than his opponents' "hysterical" response. The planned hearings are causing concern among Muslim Americans and civil right activists, who say that they unfairly single out one faith. Opponents have suggested King is conducting a witch hunt similar to Senator Joseph McCarthy's efforts to expose communists in the United States in the 1950s. King said that rather than a modern-day McCarthy, he sees himself as "a modern-day American who realizes the threat we face" from Muslims living in America who are radicalized by their mosques or the internet. He added that "no one is going to be unjustly attacked" at the hearings. Two family members of Muslims who were radicalized are expected to testify Thursday. Melvin Bledsoe, the father of Abdulhakim Mujahid Muhammad, will tell the story of his Baptist-raised son who converted to Islam in college, traveled to Yemen and was imprisoned there for overstaying his visa. Muhammad ultimately returned to the United States and killed two military recruitment officers in Arkansas. The other family witness is Abdirizak Bihi. Bihi was the uncle of Burhan Hassan, who ran away from home at seventeen to travel to Somalia with other teens in his Minneapolis community. The group would fight, and eventually die, with an al-Qaeda affiliated group there. In addition to these family members, the first Muslim-American member of Congress, Keith Ellison (D-MN), and two other members of Congress will testify. Also testifying will be Sheriff Leroy Baca from Los Angeles County, California. Baca is testifying as the Democrats' one witness. House Democratic aides have criticized King's witness list for not including any law enforcement officials or anyone who could substantiate his claim that Muslim communities are not cooperating with law enforcement. "I think have heard enough of government officials," King said in response to the criticism. "We're going to have people who live in the Muslim community, who have been personally affected by this. So the average American out there watching this rather than seeing bureaucrats or people reading prepared testimony are going to hear people who've suffered, hear them speaking from the heart and see what they've gone through." King also discussed his past with Muslim-Americans living in his own district. He said that before the September 11 terrorist attacks, he "had young students from the mosque interning in my office, I socialized with people in the Muslim community, spoke at mosques often." After September 11, King said that "people I thought I knew, people who were very prominent in the Muslim community were denying al Qaeda was involved in the 9/11 attacks. They said it could have been Jews, it could have been the CIA, it could have been the FBI and not one Muslim leader on Long Island rebutted them. There was deafening silence." In response to a question about whether these hearings could cause Muslims to be less inclined to cooperate with law enforcement, King said, "I don't think that a patriotic Muslim is going to refuse to come forward because of a hearing." King added that he wants young Muslims watching the hearing to come away with the message that the "future is theirs." "We look upon them to be outstanding American citizens in the future," he said. "And not allow al Qaeda to pervert their religion and to radicalize people in their community." King said Thursday's hearing is just the first in a series examining radicalization among Muslims.